RV Seminars You Won't Want To Miss - RSVP Today! RV Seminars You Won’t Want To Miss – RSVP Today! Here at Wilkins RV, we know that an educated RVer is a happy camper. We want to make sure our customers are getting the most use out of their RVs. That is why we continue to offer Free RV Seminars on popular topics that help our local RV community. On October 28th, we have two new RV seminars that you won’t want to miss. Space fills up fast, so make sure you reserve your spot at these fun, informative and free information sessions as soon as possible. Learn the best tips and tricks for cooking, cleaning and organizing your RV. This is the seminar you have been asking and waiting for! In this 90 minute session you will learn and the ins and outs tricks for the domestic upkeep of your RV. Three experience RV ladies will show you quick and easy RV recipes you are sure to love. This includes a taste test so you can try these delicious creations for yourself. Next you will learn some handy clean up tips in this demonstration of real life RV cleaning experiences. Finally, we will show you how to maximize your RV’s storage capacity with invaluable space saving techniques. If there’s one thing RVers know, is that we can ALWAYS use more space. This seminar will help you make the most of your RV storage. Registration is required and space fills up fast, so RSVP today! It’s the little things that make a big difference. Learn about the top 3 time and cost killers and what you can do to prepare yourself so you can enjoy your travels to their fullest. 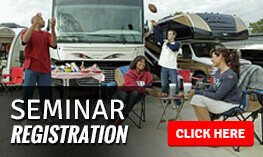 This informative seminar by RV masters is helpful to both motorhome and trailer owners. Be prepared and enjoy your RV experience even more! RSVP to reserve your spot today! See you there!